This a guide book to our Sound World. Browse a normal travel guide and you’ll read detailed descriptions of wonderful places to visit and enjoyable experiences to have. Modern lives are dominated by what we see, and so normal travel guides describe beautiful vistas, eye-catching art and iconic architecture. But the sounds of many places we visit are part of the experience. And in some cases, what we hear is more important than what we see. Increasingly, people are going to capture the World’s sonic wonders, whether deliberately by recording what they hear on a mobile phone, or almost by accident, as the soundtrack on a video recording. This website wants to identify places with unique sound characters and encourage people to become sonic tourists. 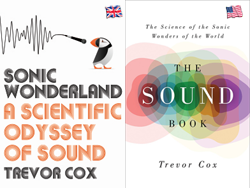 Sonic Wonders is Authored by Trevor Cox, Professor of Acoustic Engineering at the University of Salford and radio broadcaster. I also author The Sound Blog where I write about other stuff in acoustics and audio that I find interesting. The website has now inspired a popular science book published in early 2014. At this time of year, many people are pouring over guide books and travel articles to find a destination for their summer holiday. Open the average travel guide and you’ll read descriptions of beautiful vistas and iconic architecture to look at, along with accounts of amazing experiences readers could enjoy. But what about wonderful sounds or striking acoustics you might travel to hear? The average travel guide contains precious little about places that sound interesting. They also rarely describe the soundscapes of popular destinations. And yet there are plenty of tourist sites where what you hear is essential to the experience, sometimes to the point of being more important than what you see. In an effort to redress the balance, I have established a website, www.sonicwonders.org, which is an on-line guide to sound tourism: a ‘rough guide’ to sound. The site is intended to be for the general public; it isn’t just for acousticians. Don’t worry, I’m not suggesting that all members of the Institute should go on a busman’s holiday. Although if you’re anything like me, I’m sure you regularly pick up on curious acoustic phenomena as you travel about. I remember visiting a church crypt in France last summer, and horrifying my wife by clapping my hands to test out the acoustics. I should point out that the room was empty: I’m not a complete heathen. I’m hoping that some of you are like me, and have experienced interesting-sounding places which I can include on the website. If you can think of place, please send me the information: you’ll find a link at the top of the website labelled ‘suggest a place’. My hope is to gradually increase the number of places on the website during the spring, before trying to interest the mainstream national travel media in the early summer. Others have assumed that the site is purely aimed at the visually-impaired, but that isn’t the case. I would of course be delighted if blind people found this a useful resource, and for that reason I have spent a considerable amount of time trying to make the site more friendly for people using screen readers. The website is motivated by a couple of key issues. One of these is to provide an opportunity for a bit of lightweight science communication. The other is to make people more aware of their sound environment. In many ways we live in lo-fi world where sound quality is neglected, and I would suggest that one cause is that people aren’t attentive to the soundscape they inhabit. We habituate to poor sounding places, like those suffering from the constant drone of traffic noise which pollutes much of the UK, to the point that we miss out on hearing remarkable things because we are too busy shutting out the noise or listening to our iPods. I’m hoping that the site might help make people more sonically-aware. There are a number of sound maps that have cropped up on the Internet in the last couple of years. By soundmaps, I don’t mean the noisemaps being produce because of the European Noise Directive. What I’m referring to here is maps embedded with links to sound files, where the website visitor can readily find sound files based on where the audio was recorded. Nowadays, the equipment to make reasonable-quality sounding recordings is relatively cheap: indeed, you can use a mobile phone if you want. If recordings are geotagged, then it’s relatively easy to make maps with the location of recordings marked. Displaying data geographically, often on a Google map, is a common trick on Internet sites. One such map has been developed as part of the Sound Around You project. This asks the public to upload geotagged recordings to a website, along with comments about the sound and a rating of soundscape quality, which gives researchers the chance to examine peoples’ opinions on soundscapes. Another example comes from the BBC World Service project Save Our Sounds which I worked on last year. This asked listeners to send in recordings of endangered sounds from around the World, and the audio was then loaded onto a map. With these projects, once the public have uploaded their sounds onto the map, there isn’t very much more for them to do. The main enjoyment seems to be in recording and archiving. If you visit these sites, a few idle moments can be spent listening to the files people have uploaded, but after that it’s unclear what the causal user might do, unless you are searching the map for a specific sound you want. My new site, www.sonicwonders.org, is exploring a new use for soundmaps which I hope will attract casual users, because it’s a website about finding places to visit, rather than just being an on-line library of sounds. One of the joys of developing the website has been exploring the wealth of information which is now available at your fingertips via the Internet. When you visit the site, you’ll see that the pages are rich in content such as sounds, photos and videos. This is now possible because sites such as Flickr, Wikipedia and YouTube contain pictures and video which are free to use for non-commercial purposes. I can even give a sense of experience people might have visiting these places based on content from travel review sites such as TripAdvisor; this is especially useful for places I haven’t visited myself. Unfortunately, it isn’t so easy to get hold of good quality sounds. While sounds are present on many of the YouTube videos, the quality of the recordings is often terrible, with wind noise and distortion being common. Some sites such as freesound.org and soundtransit.nl are useful sources for sound files with appropriate licenses for non-commercial reuse. However, the number of non-musical sounds available on the web is surprisingly limited. And those which might be out there are often they are very difficult to find via search engines because they are not labelled properly. But the power of the Internet goes further. SonicWonders features all the web 2.0 functionality that you might expect: user comments, rss feeds, user ratings, tag clouds, sharing features linking to Facebook and Twitter etc. But I haven’t had to spend months implementing all this from scratch because, as is common with many websites nowadays, it’s actually a WordPress blog made to look like a webpage. What amazes me, is how many additional features have been written for WordPress, such as the audio player, accessible video controls and Google map plug-in I’m using, which are essentially given away free. What makes a sonic wonder? I’m still experimenting with locations to include on the site. Examining current soundmaps, it’s apparent that many people get very interested in subtle soundscape features and almost-hidden sonic treasures. But in the first instance I think I need to concentrate on the big and brash; especially if I’m to interest the mainstream travel media and the widest possible public. However, if you get to this place after the crowds have arrived then the soundscape isn’t so serene, as the embedded YouTube videos on www.sonicwonders.org indicate. Indeed downstairs, it sounds more like a municipal swimming pool during a kids’ float session. The subtle whispering effect is lost by the sounds of endless whooping and shouting as visitors test out the echo in the gallery. However, upstairs in the whispering gallery the dome still creates an echo. We’ve all heard echoes, and so this may not immediately strike you as being noteworthy, but the repeating nature of the echo in this building is very unusual, and well worth seeking out by sound tourists. Sound keeps racing around the inside of the dome, so that 3 or 4 times a second, the sound whizzes past your ear. At quiet times, this repeating echo can be heard 7-10 times before it becomes inaudible. But, www.sonicwonders.org doesn’t entirely exclude more subtle sound features: ‘squeaking sands’ is a good example. I first experienced the phenomena on the blindingly-white, Whitehaven Beach in the Whitsundays, in Australia. As you walk along the beach the sand squeaks underfoot: it’s a distinctly odd acoustic effect. If you want to experience this effect closer to home, then the only beach in the UK where it happens is apparently at Porthoer in North Wales. This place is known in English as Whistling Sands, which seems a rather odd name given that the sand squeaks. The Australians are much better at being very literal in their places names, and down under there is actually a place called Squeaky Beech. One suggestion is that the sound is caused by friction as the grains rub against each other, but this isn’t proven. What is known, is that you need the right sort of sand grains: ones which are near- spherical with no sharp edges, and with the right distribution of grain sizes. This is probably why the effect is only heard on some beaches. The squeaking is most audible when the sand has been recently washed, and so it’s rarely heard far from the shoreline. On the beach, the sand works most reliably when dry (although submerged and wet sand can sometimes squeak) so check the weather before travelling, especially to North Wales! If this effect is too subtle for you, then maybe consider visiting a booming sand dune instead, where sound levels can apparently reach 100dB. I own The Sound Book and love this site, but are there any CDs that I can buy that have these sounds on them? Thanks. Hi Trevor – It would be great if you could put a link & a plug for my new website on the Sound Tourism web page. Shanghai Sound Guide – just launched -is a fully bilingual (English & Mandarin) guide to the city based on sound. I am a sound artist from manchester. I think this website is excellent, I knew about a lot of these mysterious sounds and places already but to have them all in one place with maps and so much information is amazing, so i just bought your book too! An interesting place that I have observed that you might want to add is Manchester Central Library. In the main room with the big domed ceiling there is the most amazing echo. I have been in the library after hours for a gramophone DJ event and was thus allowed to make some clapping and yelping noises and hear the results. The sound ricochets multiple times and and varying speeds from all over the dome. I have since taken people in to the library to show them and it is quite fun finding the biggest book you can and pretending to accidentally drop it, then listening to the results. You get scowled at for creating such a loud noise in a silent place, but it’s totally worth it. Have you thought about setting up a Facebook page it would be great to follow your work from there. At Mine Cristal, a quartz crystal mine located in Bonsecours, Quebec, Canada, we perform meditative music on crystal instruments. Our musical instruments are composed of pure quartz crystals. We have reproduced existing instruments in quartz crystal, such as singing bowls and didgeridoos. We have also created a brand new instrument which we call the Crystal Harp or the Crystal Lyre. It has clear tubes of pure quartz crystal that resonate with a long-lasting fundamental and a myriad of overtones. The sound of these instruments is amazing. We welcome all sound tourists! As an industrial acoustics engineer, I’ve found many curious sounds. The most memorable was the sound of cavitation of mud in an above ground mud pipeline. This pipeline discharged mud into a field at the open end. At the pump about 3 miles away, line pressure were about 1000 PSI. Occasionally, a pump discharge valve on the recip pump would fail, causing the pulsation in the discharge to increase dramatically at 1x running speed. As static pressure decreased to atmosphere, the negative part of the pulsation wave would go momentarily below the cavitation pressure forming bubbles. As the wave pulsation wave increased again, a hydraulic transient would be generated as the mud slammed back together. The result was a pressure wave of about 1500 psi in the pipe, 2.5 per second, traveling at 4500 ft/sec. Since the air sound speed was only 1200 ft/sec or so, the sound seemed to come all at once as a line source along the pipeline. The noise was further modified by local mountains around this field. We recorded the sound from a bunch of B&K mica to our Teac Data recorder, but I don’t think we have the tapes or recorder any more. I think you can hear it in the background ona videotape we took. If you want to travel there, it is dead center Jamacia. Euarton, t think. But you need to get there on a day when they’ve had a valve failure. Hi, I’m listening to your interview on NPR’s Fresh Air. I’m in San Francisco. Another place to hear squeaky beaches is along the south shore of Lake Superior in Michigan’s Upper Penninsula. I’ve never experienced squeaky sands, but I know that there is a relationship between temperature & the sound from walking on snow. If it’s really cold (-25 C or so), it is squeaky. Lovely site, thank you. I look forward to checking out your suggestions for Croatia and Serbia this year. One ethnomusicologist Steven Feld has done some interesting explorations of how the sounds of nature contribute to human music-making, you may be interested in his work. Congratulations on your new site. Interestingly, i own a blog in Portugal called “Viagens pela Acústica” (in English probably “Traveling in Acoustics”), which was born from a similar idea. I hope to contribute to this new site and i will certainly link it to my blog (i did it already with your blog). Regards from Portugal, Tiago F.